Give your loved one a surprise they'll remember forever this Valentine's Day. 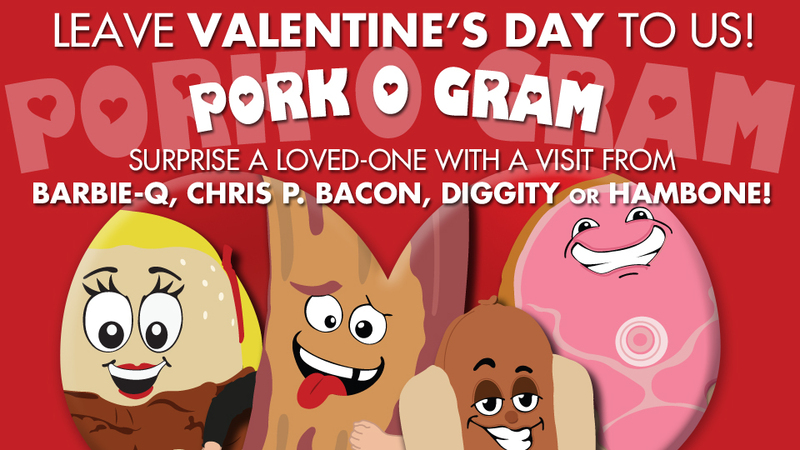 The Lehigh Valley IronPigs are now accepting reservations for Valentine's Day Pork-O-Grams! Choose your favorite pork racer - Hambone, Chris P. Bacon, Diggity or Barbie Q. - and on Thursday Feb. 14, they'll travel anywhere in the Lehigh Valley, delivering roses, candy and other IronPigs goodies to your loved one. For $125, these gifts will be delivered to your loved one by your chosen Pork Racer on Valentine's Day -- Thursday, Feb. 14. Quantities are limited and time slots will be filled on a first-come, first-serve basis. Pork-O-Gram requests must be made by Monday, Feb. 11. Please note that Valentine's Day Pork-O-Gram's are restricted to Lehigh and Northampton counties or within a 25-mile radius of Coca-Cola Park. Click here to order now.